Improvements in the efficiency of photovoltaics lowers cost, as higher efficiency will lower overhead costs of installation, maintenance, and grid integration. For high efficiency photovoltaics, optimization of both current and voltage is necessary. High current is achieved by absorbing most of the above bandgap photons, and then extracting the resulting photo-generated electrons and holes. To achieve high absorption in thin films, surface texturing is necessary. Surface texturing allows for absorption enhancement, also known as light trapping, due to total internal reflection. However, in subwavelength-thickness solar cells (~100 nm thick), the theory of light trapping is not understood, and both the maximum achievable absorption and the optimal surface texture are open questions. Computational electromagnetic optimization is used to find surface textures yielding an absorption enhancement of 40 times the absorption in a flat solar cell, the highest enhancement achieved in a subwavelength-thick solar cell with a high index of refraction. The optimization makes use of adjoint gradient methods, which allow the problem of designing a 3D surface to be computationally tractable. However, while high current requires high absorption, high voltage requires re-emission of the absorbed photons out of the front surface of the photovoltaic cell. This re-emission out the front of the solar cell is required by the detailed balance formulism outlined by Shockley and Quiesser in 1961. At the open circuit voltage condition, where no current is collected, ideally all absorbed photons are eventually re-emitted out the front surface of the solar cell. The small escape cone for a semiconductor/air interface, as described by Snell’s law, makes it difficult for the photon to escape out of the front surface; it is much more likely for the luminescent photon to be lost to an absorbing back substrate. Thus, a back reflector on a solar cell is crucial to obtaining high voltage, as it helps the internally emitted photons in the cell escape out of the front surface. The open circuit voltage difference between a solar cell with a back mirror and a solar cell with an absorbing substrate is quantified, and it is found that the benefit of using a back mirror depends on the absorptivity of the solar cell material. The back mirror concept is extended to the sub-cells of a multijunction cell, and an air gap as an “intermediate” reflector is proposed and analyzed. In a dual junction solar cell, it is shown that proper mirror design with air gaps and antireflection coatings leads to an increase in open circuit voltage, resulting in a ~5% absolute efficiency increase in the solar cell. This concept has been validated experimentally in a 38.8% efficient 4-junction cell created by the National Renewable Energy Laboratory. 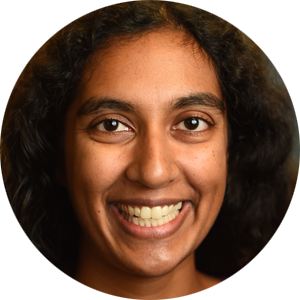 Vidya Ganapati is a Postdoctoral Associate at Verily (formerly Google[x] Life Sciences), working on robotic surgery. She received her Ph.D in Electrical Engineering & Computer Science at the University of California, Berkeley in 2015 and was advised by Prof. Eli Yablonovitch. Her graduate work centered on the optimization and thermodynamics of high efficiency photovoltaics. She was a recipient of the Department of Energy Office of Science Graduate Fellowship and the UC Berkeley Chancellor’s Fellowship. Her undergraduate research at the Massachusetts Institute of Technology was advised by Prof. Tonio Buonassisi and focused on imaging microdefects in multicrystalline silicon with infrared birefringence. Her current research interests include applying optimization algorithms to applications in photovoltaics, renewable energy systems, and bioimaging.